The hype-train is moving fast and furiously toward the E3 2014 station and the bubbling over of excitement is almost reaching a fever pitch as we tomorrow (if you're reading this before June 9th) will mark the day that some gamers will spend the evening cleaning up a mess after they explode from all the megatons. Well, a pre-megaton dropped for Sunset Overdrive, the cartoony, open-world action game from Insomniac Games that will apparently feature up to eight players being able to get down and dirty in the game's open world with co-op hijinks to elevate the fun-factors to unforeseen heights. Gamers 4 Xbox caught wind of a page update over on the official Sunset Overdrive page through the Xbox website. What did the page show? 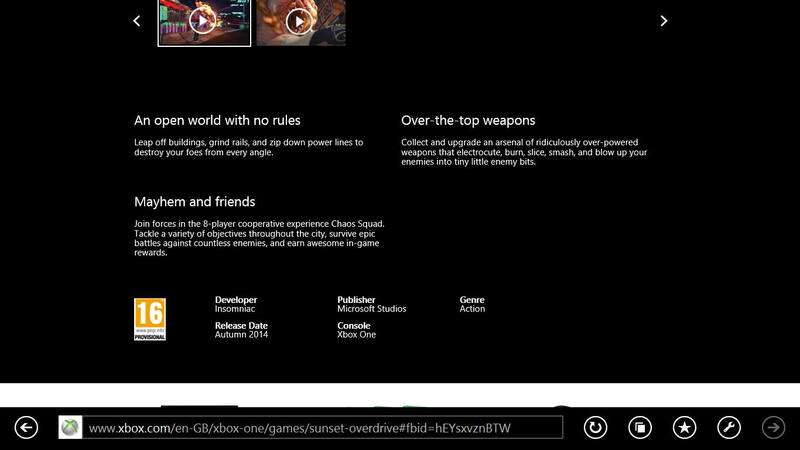 Well, before Microsoft sent in an operative to perform a stealth edit, the game's page showed the following information regarding the multiplayer component. Do you see it? Is it visible? It's right there – the now removed entry – showing that there will be an option for up to eight players to join forces and take the game's world by storm in online cooperative modes. Leave it to Reddit to find some fault with the news, however. As there's a surprisingly strong repellent to the co-op given that there's no mention of split-screen. That's right, there are still people out there who enjoy playing games with people they either live with, invite over or enjoy entertaining. It makes sense given that one of the biggest appeals for Nintendo's titles are local multiplayer options. In fact, that was the one thing that stood out most with Mario Kart 64 back in the day, because you could invite over friends or family and throwdown in four-player bouts. That bit of nostalgia still seems to hold true even today with the sparkling popularity of Mario Kart 8. Online is great and all but a lot of times it's also fun just play with the people you have over for one reason or another. Funnily enough, this was also one of the biggest issues with Crackdown, too. I remember bringing over a few 360 games to a friend's house early on in its lifespan and the one game we couldn't play was Crackdown, a game that heavily advertised and touted its two-player cooperative features. Instead we settled on playing Gears of War and Monster Madness. Anyway, it's a bit disappointing if it turns out that there won't be any local multiplayer features for Sunset Overdrive. I guess we can't expect too much from a system that had trouble running Call of Duty: Ghosts above 720p. We can expect to see more for Sunset Overdrive when the game makes another big splash at E3 tomorrow.